Han Solo? More like Han YOLO! 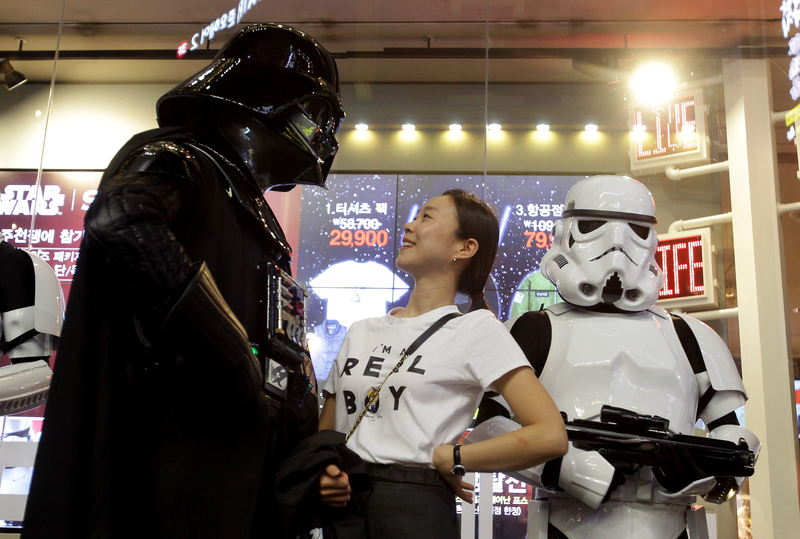 Fans anxiously awaiting the Dec. 18 release of Star Wars Episode VII: The Force Awakens got an opportunity to celebrate the latest installment of the Star Wars franchise on Friday, Sep.4, thanks to the event known as Force Friday. Helmed by Disney, this new holiday (of sorts) involves an unveiling of new Star Wars: The Force Awakens merchandise for fans across the galaxy to nab in stores and online, so there's officially no excuse to not have your holiday shopping completed early — at least as far as gifts for Star Wars fanatics go. Obviously, fans came out in throngs to stampede their way through toy aisles with the resolve of an army of Stormtroopers once the clock struck midnight on Sep. 4. Speaking of Stormtroopers, there were several on hand during the holiday to twerk out (yes, twerk) their excitement over the toy bonanza — but I'll get to that in a bit. Even those elbow-deep in the cacophony of excitement that filled stores carrying the new merchandise found time to share their exultation on social media. Hopefully no one taking part in the #ForceFriday trend on Twitter got their smartphone knocked from their grip by a light saber — although I wouldn't be surprised. As one who has (quite unfortunately) not been privy to much of the franchise — and experiences FOMO on a daily basis over not partaking in Star Wars fanaticism — I have been able to comb through the craziest Force Friday tweets from my seat in a galaxy far, far away from all the new merchandise. And by "galaxy," I mean a Barnes & Noble near my house. Enjoy! Sometimes a mere 160 characters is simply not enough to illustrate your unbridled elation over Force Friday. Lo and behold, the beauty of GIFs and dancing Stormtroopers. Either go big or go home. Or, rather, go big and go home — where you will spend hours playing with all your new Star Wars loot. If the journey is just as important as the destination (i.e., the destination is your apartment where you and your roommate will don new on fleek Stormtrooper helmets, thus leading to a light saber battle), then you best be ready to share your Force Friday shopping experience on social media. May the puns be with you. Clearly, this Force Friday did not disappoint. We only have a few months until the new Star Wars installment hits theaters, and I have a feeling the new merchandise is enough to keep all you fans occupied until the time comes to don your best cosplay attire and line up at your respective cinemas.